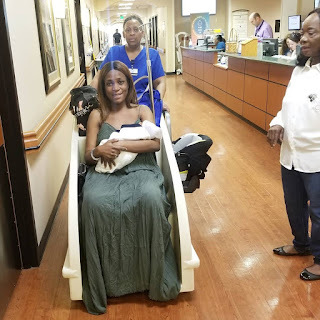 New Mum Linda Ikeji names newborn son after his dad Jeremi Sholaye ..
Africa's biggest Blogger Linda Ikeji welcomed her son a few day ago.During her pregnancy Linda refused to disclose any details about if she was married or the father of her baby or on what terms she was going to become a mum. Shortly after that rumours began to fly that the blogger was engaged to oil mogul Jeremi Sholaye. This evening as the new mom prepared to leave the hospital with her son, she shared her baby's name.His name is Jayce Jeremi she shared. Did Linda just confirm the rumours that indeed Jeremi Sholaye is her father's son? and that she may even already be married to her oil mogul beau? Anyways..Congratulations once again to her and welcome again Baby J now Baby Jayce Jeremi!